Concerned for your loved one living alone? We call it Virtual Caregiving. You’ll call it a Life Changer. Imagine a world where you receive a notification on your mobile device if something isn’t right with your loved one at home. We call this virtual caregiving, and it will change your life. envoyatHome’s system of smart sensors and innovative software monitors for your loved one’s well being and communicates with you at Internet speed. Getting started is easy. By simply tapping and swiping in the mobile app, you create a personalized plan to instruct envoyatHome smart sensors to monitor and notify for what concerns you, the Caregiver – your loved one’s declining cognitive state, his safety, her privacy, or their home environment. 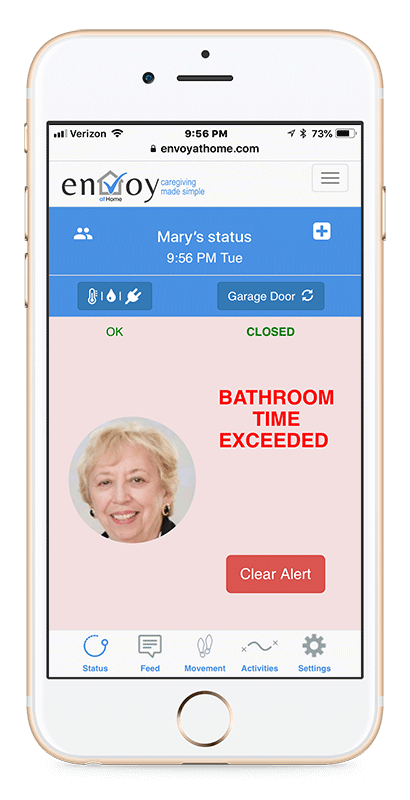 With envoyatHome there are no cameras, no microphones, no wearables, and nothing to charge – just peace of mind for you and independence for your loved ones aging in their own home or in continuing care. As a family Caregiver, a Caregiving team, a professional Caregiver or an Agency, put our patent pending technology to work for you. Choose envoyatHome to tell you what your loved one can’t. Finally! I no longer have to miss work to check on mom. Dad lives alone. With envoyatHome on the job, my family was able to take a stress-free vacation. 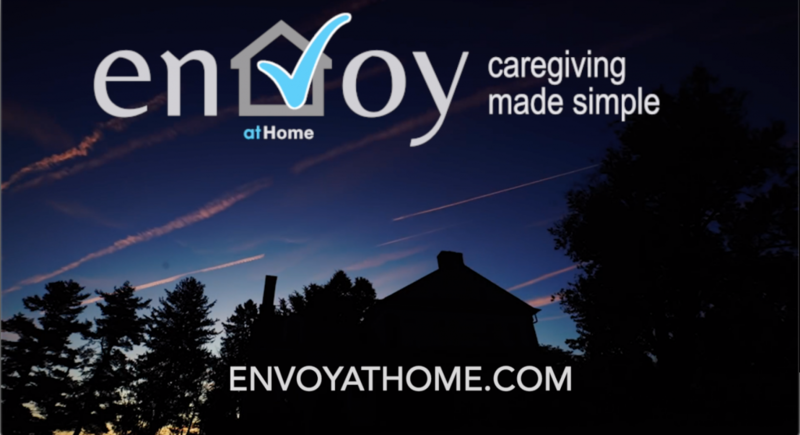 Whether you want to keep an eye on a loved one living alone, or you need to monitor the safety of someone living with dementia, envoyatHome offers a customizable solution. And you will too. You’ll get an alert if Dad tries to leave the house in the middle of the night, but not when he leaves to get the mail in the morning. You’ll receive notice for long periods of inactivity, but not when Mom is sleeping. You create an Activity Plan to tell the system what’s normal and what’s not—and you can easily change and adjust it at any time. envoyatHome can tell you what your loved ones cannot. Data obtained from the system helps identify patterns of cognitive decline, health insights, safety issues and privacy concerns. We configure, deliver and set up the system for you. Discreet battery-operated sensors are about the size of a deck of cards and require no wiring or drilling. They attach with removable adhesive to a door frame or wall. The envoyatHome team will strategically position the sensors to give you the monitoring that you need. If you are worried that mom will slip in the bathroom or dad will wander outside, we have a setup for that, and more. 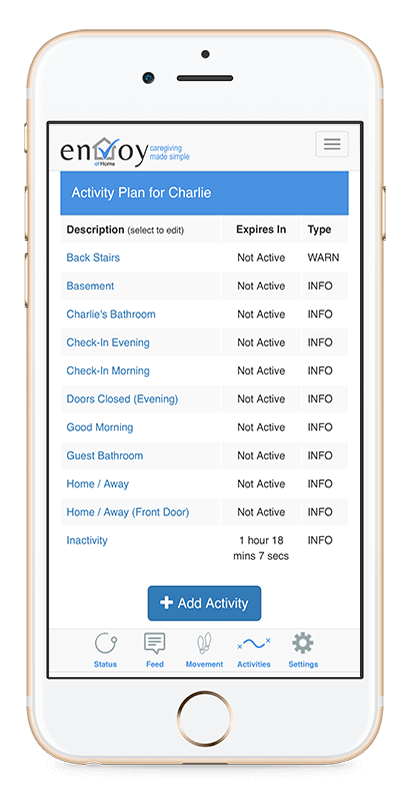 envoyatHome gives you the ability to check in on someone living alone, in real-time. We guide you through creating the Activity Plan. The customizable system lets you set alerts for the things that keep you up at night, while staying silent for the things that are under control. The system just works. There’s nothing technical for you to learn. You check in whenever you wish and enjoy the peace of mind that comes with knowing that you’ll be alerted if anything isn’t right or if you prefer, if everything is just right. You have total control. You decide what notifications you want to receive, when you receive them and who else can see the data. It’s time that peace of mind was a part of your life again. Whether you’re living next door or on another coast, with envoyatHome you’ll know when your loved ones are on track or when something seems “off”. Receive unlimited text notifications and automated phone calls customized for you and on your schedule alerting you when your loved ones are on track or when something seems "off". We will come to your care recipient's home to place the wireless sensors. We need a power outlet and a port on the back of your internet router to complete the setup. This should take less than an hour. Invite as many caregivers as you like to co-monitor your loved ones. No extra charge for caring families. Enjoy worry free care. We will change a battery (sold separately) and make any adjustments to the sensors if needed. You will receive a call from the envoyatHome team each month for a care plan checkup. Of course you can adjust the plan anytime yourself right from the app. envoyatHome enables your loved ones to live in their own home longer at a fraction of the cost of assisted living arrangements. What if more than one person lives in the home? Not a problem. envoyatHome monitors activities in your personalized Activity Plan. The system can monitor multiple people at once. For example, mom in the bathroom and dad goes down the stairs or into the basement. Both activities are monitored at the same time. What if my loved one leaves for a few days? That’s why we provide a vacation setting. 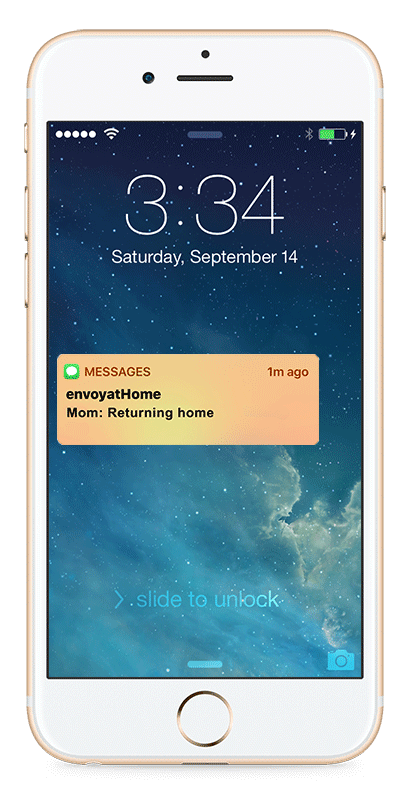 When enabled, the system will adjust monitoring and notifications until your loved one returns home. What if my Mom has an aide? The system accommodates in-home aides. You even get additional of peace of mind, for example, notification when the aide has arrived. How many caregivers can I have? Plenty. In fact, there is no limit. Additionally, you can limit caregivers to just monitoring while other caregivers can have full access. Our system improves upon smart home privacy and security. Access requires authentication and authorization using industry leading Oauth open standards. Our passwords are stored using SHA-256 cryptographic hash functions which cannot be decrypted. All data between your browser and our website is encrypted and sent securely using HTTPS over the internet. My Mom or Dad isn't tech savvy, is that a problem? Not at all. Actually, there is nothing for them to do. The mobile app is for caregivers. The entire experience is intended to simplify your busy life. Your loved ones will continue to go about their lives unaware the system is even there. envoyatHome tells you what your loved ones cannot. envoyatHome empowers your loved one to live at home – LONGER. Whether living around the corner, in the next town, or multiple time zones away, all remote caregivers are entrusted with overwhelming responsibility, but armed with little more than a telephone – until now. The Penn I-Corps Site is an NSF (National Science Foundation) program designed to facilitate commercialization of university research. The accelerator is a joint collaboration between the Penn Center for Innovation (PCI), Penn Law’s Detkin IP and Technology Clinic, the City of Philadelphia, Ben Franklin Technology Partners of SE PA, Wharton Entrepreneurship, and Penn Medicine Center for Health Care Innovation. Penn Biotech Group (PBG) Healthcare Consulting is a cross-disciplinary student run organization affiliated with the Wharton Groups at the University of Pennsylvania.